Hot dogs and baseball cards. It doesn’t get much more American than that. All this set is missing is a big red, white, and blue bald eagle on it. Man. If this set had one of those, I bet it could run for President. Wilson Franks probably isn’t the first company that comes to mind when you think of cards. But in 1954, they issued one of the most popular food related products to date. The 1954 Wilson Franks set is very small. It consists of only (20) cards. I wouldn’t let the small size fool you though. If you want one that’s in nice condition, you’re going to spend a lot. When these cards surface, they usually aren’t in the best of shape. Most of the time the centering is way off. Plus, many of the cards have stains on them. The stains come from the way they were packaged. Wilson Franks didn’t take the time to package the cards separately. They simply packaged these cards right next to the hot dogs. That’s where the stains come from. 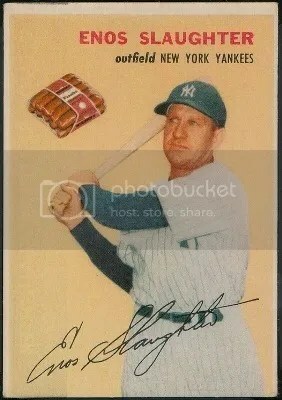 There would be a lot more cards in better condition today if they would have issued them through a mail-in program. But I guess they didn’t want to go that route. What little kid wanted to wait for a card to come in the mail anyway? The thought that these would be worth anything someday never even crossed their minds. Hall of Famers like Enos Slaughter, Bob Feller, and Roy Campanella round out this condition sensitive set. 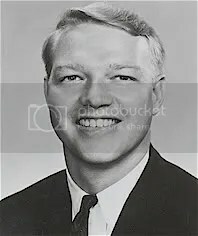 Cards of Ferris Fain, Stan Hack, and Ray Jablonski seem to be harder to find. The most notable card is that of Ted Williams. I’d have to say that my personal favorite thing about this issue is the hovering package of hot dogs. In a lot of cases the player seems to be looking at it. Remember… you never want to have wiener stains on your cards. The Cardboard Connection is having a contest where you can win 1 free hobby box of 2010 Topps Allen & Ginter. All you have to do is e-mail them a list of five cards you would like to see in 2011 Allen & Ginter. Click here for all the contest details. Jefferson Burdick – author of The American Card Catalog. 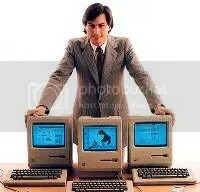 Steve Jobs Auto – Co-Founder of Apple. Harry Kalas Cut Signature & Tie Relic – Phillies Hall of Fame broadcaster. 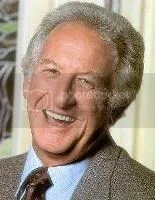 Bob Uecker Auto – “Mr. Baseball” and 2003 Ford C. Frick Award winner. Ball Park Franks – Hygrade Food Products won a competition in 1959 to be the exclusive supplier of hot dogs to the Detroit Tiger’s stadium. Hygrade Food Products launched a contest to its employees in order to come up with the best brand name for their Detroit Tigers stadium hot dogs. 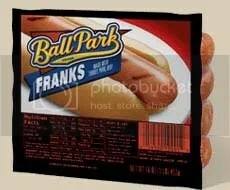 Mary Ann Kurk, one of Hygrade Food Products sales people at the time, won the contest with the name “Ball Park Franks”. In addition to this list, I would also like to see a card of Carl Stotz, who founded Little League Baseball. So who or what would be on your list?